External storage for Macintosh-based content creators just got a bit bigger with the release of new 1- and 2-terabyte storage devices from G-Technology. The company announced Monday at the Consumer Electronics Show its G-Drive mini and G-RAID mini storage devices, which are built around HGST's 2.5-inch, 1TB 7,200RPM hard disk drives. 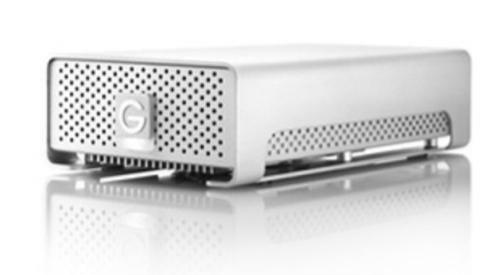 The G-Drive mini offers up to 136MB per second transfer speeds in an aluminum enclosure. The device's 1TB drive is preformatted for Macintosh systems, has both USB 3.0 and FireWire 800 connections, and is Time Machine ready, the company said. It is shipping now for approximately $244. The G-RAID mini is targeted at video editors, ships in a RAID 0 configuration, and supports compressed high definition video formats, including HDV, Panasonic's DVCPRO HD, Sony's XDCAM HD, and Apple's ProRes 422 HQ. It features a pair of 1TB 7,200 RPM hard drives and is powered by FireWire. The G-RAID mini also features a thermo-regulated cooling fan to ensure the device is operating at optimal temperatures as well as an on/off switch. The G-RAID mini can also be configured in RAID 1 protected mode with the included software utility. It is expected to ship in Q1 2013 for approximately $552.